THERE was, many years ago, a gentleman who had a charming lady for his wife. They had one daughter only, who was very dutiful to her parents. But while she was still very young, her mamma died, to the grief of her husband and daughter. After a time, the little girl's papa married another lady. Now this lady was proud and haughty, and had two grown-up daughters as disagreeable as herself; so the poor girl found everything at home changed for the worse. But she bore all her troubles with patience, not even complaining to her father, and, in spite of her hard toil, she grew more lovely in face and figure every year. Now the King's son gave a grand ball, and all persons of quality were invited to it. Our two young ladies were not overlooked. Nothing was now talked of but the rich dresses 'they were to wear. At last the happy day arrived. The two proud sisters set off in high spirits. Cinderella followed them with her eyes until the coach was out of sight. She then began to cry bitterly. While she was sobbing, her godmother, who was a Fairy, appeared before her. "Cinderella," said the Fairy, " I am your godmother, and for the sake of your dear mamma I am come to cheer you up, so dry your tears ; you shall go to the grand ball to-night, but you must do just as I bid you. Go into the garden and bring me a pumpkin." Cinderella brought the finest that was there. Her godmother scooped it out very quickly, and then struck it with her wand, upon which it was changed into a beautiful coach. Afterwards, the old lady peeped into the mouse -trap, where she found six mice. She tapped them lightly with her wand, and each mouse became a fine horse. The rat-trap contained two large rats ; one of these she turned into a coachman, and the other into a postilion. 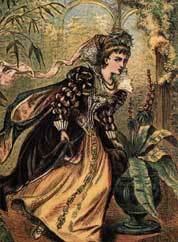 The ft old lady then told Cinderella to go into the garden and seek for half-a-dozen lizards. These she changed into six footmen, dressed in the gayest livery. When all these things had been done, the kind god- mother touching her with her wand, changed her worn-out clothes into a beautiful ball- dress embroidered with pearls and silver. She then gave her a pair of glass slippers, that is, they were woven of the most delicate spun-glass, fine as the web of a spider. When Cinderella was thus attired, her godmother made her get into her splendid coach, giving her a caution to leave the ball before the clock struck twelve. On her arrival, her beauty struck everybody with wonder. 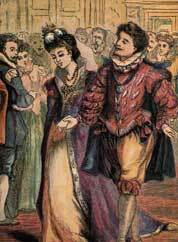 The gallant Prince gave her a courteous welcome, and led her into the ball-room; and the King and Queen were as much enchanted with her, as the Prince conducted her to the supper-table, and was too much occupied in waiting upon her to partake of anything himself. 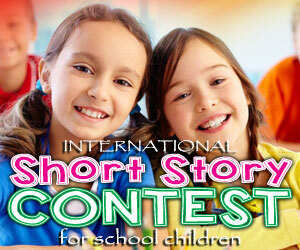 While seated, Cinderella heard the clock strike three-quarters past eleven. She rose to leave, the Prince pressing her to accept an invitation for the ball on the following evening. On reaching home, her godmother praised her for being so punctual, and agreed to let her go to the next night's ball. Although she seemed to be tired, her sisters, instead of showing pity, teased her with glowing accounts of the splendid scene they had just left, and spoke particularly of the beautiful Princess. Cinderella was delighted to hear all this, and asked them the name of the Princess, but they replied, nobody knew her. So much did they say in praise of the lady, that Cinderella expressed a desire to go to the next ball to see the Princess ; but this only served to bring out their dislike of poor Cinderella still more, and they would not lend her the meanest of their dresses. The next evening the two sisters went to the ball, and Cinderella also, who was still more splendidly dressed than before. Her enjoyment was even greater than at the first ball, and she was so occupied with the Prince's tender sayings that she was not so quick in marking the progress of time. To her alarm she heard the clock strike twelve. She fled from the ball-room ; but in a moment the coach changed again to a pumpkin, the horses to mice, the coachman and postilion to rats, the footmen to lizards, and Cinderella's beautiful dress to her old shabby clothes. In her haste she dropped one of her glass slippers, and reached home, out of breath, with none of her godmother's fairy gifts but one glass slipper. When her sisters arrived after the ball, they spoke in terms of rapture of the unknown Princess, and told Cinderella about the little glass slipper she had dropped, and how the Prince picked it up. 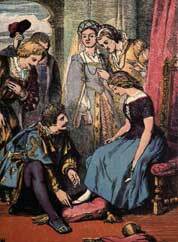 It was evident to all the Court that the Prince was determined if possible, to find out the owner of the slipper; and a few days afterwards a royal herald proclaimed that the King's son would marry her whose foot the glass slipper should be found exactly to fit. This proclamation caused a great sensation. Ladies of all ranks were permitted to make a trial of the slipper ; but it was of no use. Cinderella now said, " Let me try perhaps it may fit me." It slipped on in a moment. Great was the vexation of the two sisters at this ; but what was their astonishment when Cinderella took the fellow slipper out of her pocket ! 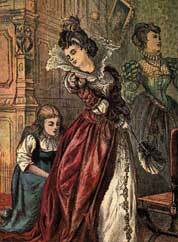 At that moment the godmother appeared, and touched Cinderella's clothes with her wand. Her sisters then saw that she was the beautiful lady they had met at the ball, and, throwing themselves at her feet, craved her forgiveness. A short time after, she was married to the Prince, to the intense gratification of the whole Court.